It’s a spectacular year for chiles of all sorts. The markets have everything from sweet Italian peppers, perfect for salsa or pickle relish, to jalapenos, serranos, and incendiary Thai bird chiles. 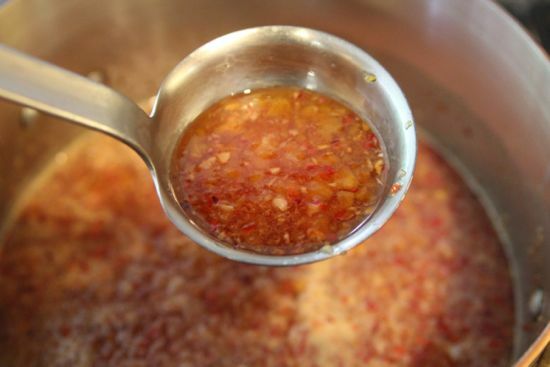 I’ve made a few batches of hot sauce, using this brilliant Sriracha-style recipe from Food52. I use cherry bombs to make Sriracha, easier to find on the East Coast than red jalapenos, or fresnos. 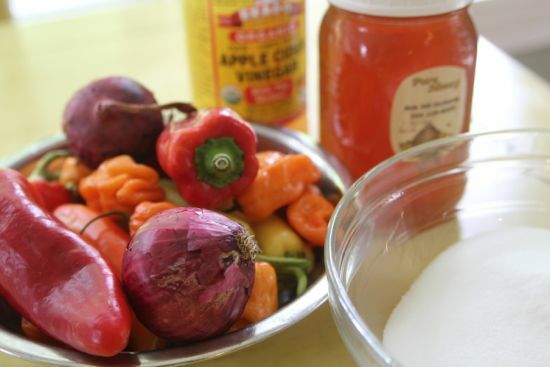 But you can also swap out jalapenos or cayenne, adding apple cider vinegar or malt vinegar and instead of palm sugar, try honey or maple syrup. Add mustard seed, celery seed, allspice. It’s a solid recipe that begs for tweaking to adjust to your market (or garden) conditions. There is always a jar of pickled peppers in the refrigerator. I’ve tried canning them, but the refrigerator version keeps the crispy crunch, so I opt for refrigerator instead of shelf stability. I’ve found these pickled chiles last at least six months and are fantastic on chili, in tacos, or chopped and slipped inside a cheese sandwich right before grilling. 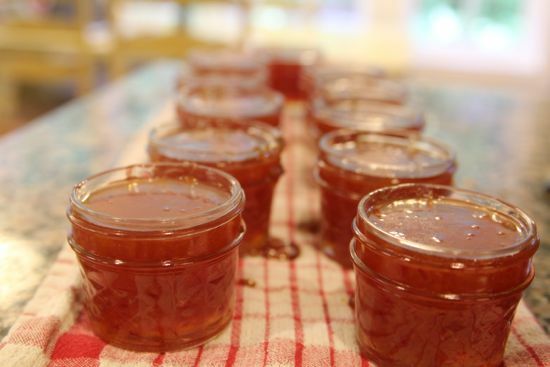 One chile preserving recipe I always make is a habanero jelly. Don’t be afraid! Yes, it’s spicy, but it’s mellowed with dried apricots and floral with honey. I modified the basic Ball recipe a few years ago, adding the apricots instead of raisins, and this year’s version is the first with honey. It won’t be the last. Serve this Habanero Gold with goat cheese. They belong together. And put it up in small, 4 oz. jars. You’ll thank me when the holidays roll around – there’s not a host in the world who won’t be thrilled when you hand over a log of goat cheese, a small jar of jam and a box of good crackers. But don’t expect them to serve it right up. The most clever among them will hoard this gift to enjoy themselves, later, when the guests have gone. There’s a lot of mincing. Make it easy on yourself and put everything in the food processor and blitz it until it’s minced up tiny but NOT liquified. Or mince it all by hand, but please wear gloves when handling peppers. I’ve begun coating my hands in some oil – canola, olive, safflower – whatever I have and then donning gloves. The capacin pepper doesn’t travel through the oil, so will further protect you from that evil, evil burn. Stir relentlessly, so nothing sticks to the bottom of the pot and/or burns. The foam will begin to disperse when you are getting close to the end. When you get a solid boil you can’t stir down, boil hard for ten minutes. 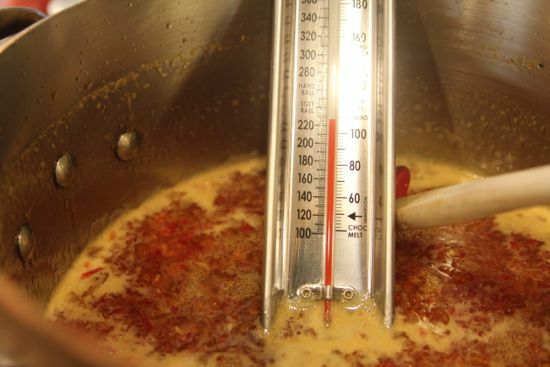 Check the temperature – the jelly will set at about 220°F. Turn off the heat and let it sit for three minutes. After the rest, here are the signs you have achieved good gel set. The surface of the jelly should wrinkle when pushed. And all those pretty pepper pieces will not be floating on the surface, but will be distributed throughout the jelly. If you like it firmer, boil longer, but be careful. It’s easy to go from jelly to rubber. If there is still a little foam, and you like the set, add a pinch of butter to rid yourself of foam. Ladle into warm, sterilized jars, leaving 1/4″ headspace. Add lids and rings and process in a boiling water bath for ten minutes. Try a goat cheese cheesecake topped with this preserves. Or serve alongside manchego, instead of figs. Really, there are so many lovely things to do with this spicy, sweet, complex preserves. Enjoy! I love combining sweet and heat; this sounds fabulous Cathy. This sounds incredible. On my to do list. Nice recipe! I developed one for Habenero/Rosemary Jelly. Also awesome with cheese or on a fresh biscuit slathered with butter. This recipe is timely. My husband and i were just talking about what to do with all the habenero’s growing in our garden. I planted four plants and each one has about a dozen peppers on them. Thanks, I’m excited to try this. My FAVORITE!!!!!!! I was just talking about it the other day at the CSA! I adore the sweet-heat combination and often make jalapeno jelly to serve in much the same way. But this, with the addition of the dried apricots and onion sounds much more interesting. I’ll be giving it a go soon. This sounds fantastic! On my “gotta try this now” list. Love the idea of apricots and honey playing off the heat of the peppers …and with goat cheese and crackers – YUM! Thanks for your modifications. I made a batch today and it is wonderful – surprising and complex flavors. I was a little nervous about the heat so I used 4 jalapeños and 4 habaneros. The yield was a little less than your recipe. Also, take care not only to cover your hands, but not to inhale the steam that escapes as you boil the jelly — it is quite potent and if inhaled can really make you cough! Just made the Habanero Gold today and oh, it is so delicious. I might need to make a second batch. Great! I love the stuff. OMG! My wife and I just finished making a batch. We ended up with 7, 4oz., jars and 1 6oz jar and about 3 oz left. We processed all but the 3ozs. which will be ingested shortly. lol. So delighted! It’s wonderful to have the cocktail hour all taken care of, hm? Thanks for the nice comment. I made a batch with habaneros I got from my CSA. What a great way to use them! It is beautiful in the jars and tastes great. Very spicy! Not for the faint of heart! Does it mellow with time, I wonder. I didn’t have quite enough apricots so I threw in about 2 oz dried cranberries. I have never made jelly before, and probably should have let it boil a bit longer. My jelly is a little runny. But, as I said, delicious! Does it matter whether the honey is clear or set? For both batches that we have made, we have used clear honey. Since the final product looks like marmalade, I would suggest using that. I’m sure you will enjoy it! Thank you Rene. I’ll let you know how it goes. I used Scotch Bonnets rather than habaneros, orange blossom clear honey and preserving sugar (the type without added pectin). Couldn’t quite get up to 228° on our electric cooker so went for 13 minutes boiling at the hottest I could get it: 220°. Looks and tastes great – and the set is exactly what I’d hoped for. First preserve I’ve ever made and I’m delighted. Thank you Cathy & Rene for you tips! Jon, I’m so glad it all worked out for you. And from there, to every other preserve under the sun, right? If you mean liquid honey or crystalized honey when you say clear or set, then no, it won’t make a difference. Crystalized honey will melt in the cooking process and return to a liquid state. I can with crystalized honey all the time and find it much easier to work with, especially since honey is measured in a dry measure cup. Isn’t it simply superb that there is this website where we all learn and enjoy it? No judging only “gentle” suggestions and no attitude! This is among the greatest things about this website, attitudes are checked at the door. What I didn’t include in earlier posts is that my wife and I are high school teachers. I brought some to share with friends. Major mistake (please learn from this teachable moment): the 4-5 friends I shared this with couldn’t keep the secret. I have had to fend off requests for the rest of the school year and already have orders for September!!! I grew a habanero plant for the first time this summer. Having no clue and no sense I tried a tiny piece of one. I figured I could handle most things… I was wrong and sat with a block of ice on my face for an hour. So I cowered from the plant and it proceeded to explode with about 30 huge yellow-orange peppers. Lucky for me I stumbled on this most amazing jelly. It’s pretty hot but the hotness doesn’t linger. Doubled the batch and it turned out great. Thanks a lot – I am completely addicted. I also stirred some up with some nuts and toasted them… fantastic! Great recipe, thanks! I would never have thought of making jelly with habaneros, but it tastes great. 🙂 I don’t use honey so I took syrup instead, it worked out fine. I also replaced some of the sugar with “jelly sugar”, which has added pectin. You might want to clarify that the 220 degrees are in Fahrenheit. We use Celsius where I live, and 220 degrees F are equal to 104 degrees Celsius, so that’s quite a difference! I didn’t do the “hard boil”, I just put it over medium high heat, and let it slowly rise to 104 degrees Celsius while stirring. You’re totally right about the Fahrenheit v Celcius. I’ve fixed it! Glad you like the jelly. It’s one of my favorites. Does the c mean cup ? Silly question, I’m sure! But, are you using fresh habanero or the pickled ones that you have made for the frig?